Racing toward Mars, 10 minutes before reaching the atmosphere, the cruise stage ejects and then burns up in the atmosphere. Mission complete, cruise stage. Thanks for bringing the Curiosity rover 354 million miles (570 million kilometers) through the cold void of space. On the heat shield, an instrument named MEDLI turns on. It's ready to measure how hot the spacecraft gets from the extreme friction of a rapid descent through the Martian atmosphere. Predictions are two times hotter than the space shuttle upon Earth entry! It will also measure how the spacecraft's orientation changes in interacting with the dynamic atmosphere. Engineers are excited about this data, the first collected in the atmosphere since the 1970s Viking landers. It will help improve the design of future missions to Mars, making them safer, more reliable, and lighter weight! Incoming! A brand-new method for guided entry and precision landing. Going a ripping 5.8 kilometers per second, the spacecraft ejects two solid tungsten weights - each about 165 pounds (75 kilograms) and the size of a laptop-- shifting the spacecraft's center of mass. 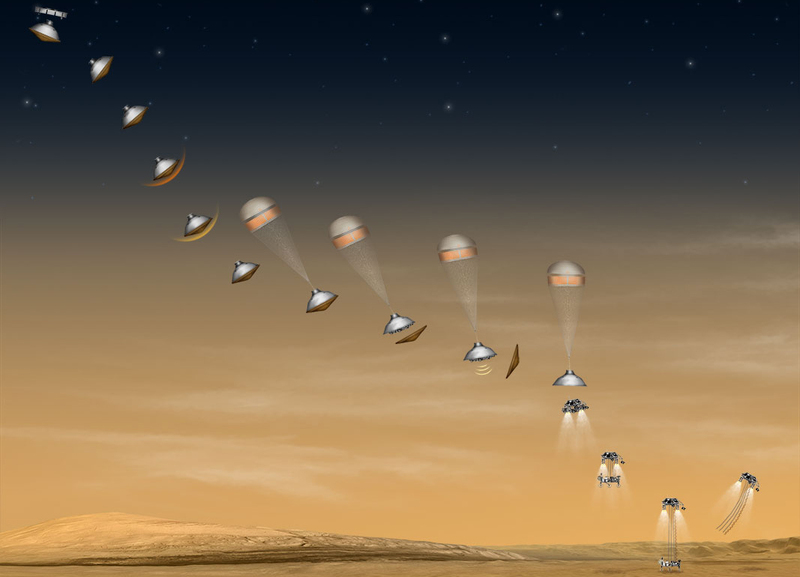 With small thrusters at the ready, the aeroshell containing the Mars rover Curiosity can now generate lift and use it. That helps improve landing accuracy from hundreds of miles to about 12 miles (20 kilometers). For comparison, the Mars Phoenix Lander had a landing ellipse the size of Gale Crater, but the Mars rover Curiosity will land within a small area inside of Gale. Talk about self control! It's a big deal. It means we can go places we've never gone before, able to land safely in thousands of sites rather than a handful. It means that, no matter where it lands, the rover can be in driving range of the rocks and minerals that may hold clues to the possibility of life on Mars. Get ready, get set, go! From the official starting line of entry, descent, and landing (EDL), it's all about self-steering! Entering the atmosphere almost 80 miles (125 kilometers) above the martian surface, wind shear in the upper atmosphere swipes violently at the spacecraft. Taming this wild ride, small thrusters on the backshell adjust the angle and direction of the spacecraft's lift to head toward the landing site. Carving a path through the martian atmosphere in a series of "S-shaped" curves, the aeroshell begins to slow down dramatically from 13,200 mph to 1,000 mph (5.9 kilometers per second to 0.45 kilometers per second). Eighty seconds after entering the atmosphere, it's hotter than hot! Due to the spacecraft's huge size*, the heat shield reaches the hottest temperature ever for any Mars entry vehicle, about 3,800 degrees Fahrenheit (2,100 degrees Celsius). Engineers had to coat the entire outside with a honeycomb of special materials to avoid any "melt downs"! As hot as it gets on the outside, though, the Curiosity rover stays at a cozy temperature of 32 to 77 degrees Fahrenheit (0-25 degrees Celsius) inside the aeroshell. *About 14.8 feet (4.5 meters) in diameter and some 6,950 pounds (3,152 kilograms)! Hold on tight as friction in the atmosphere slams on the "brakes"! The heat shield takes the brunt of it, slowing the spacecraft from 13,200 to 1,000 miles per hour (5.9 to 0.45 kilometers per second). That's reducing about 90 percent of the kinetic energy the spacecraft had when it first hit the atmosphere. The capsule's shape and mass offset keeps the air pressure lower on one side of the capsule, producing lift. That's a little like the way airplane wings work. They change angles and tilt to create lower air pressure on top and greater on the bottom, creating the lift that allows them to fly. Yet, unlike birds or your average plane, the spacecraft is travelling at hypersonic speeds-that's more than Mach 5! At that speed, molecules of air break apart, creating hot plasma around the spacecraft. Shock waves cause air density and pressure to waver dramatically, so being quick to respond by design is vital. Whoosh! Out pops the parachute, about 255 seconds after entry and 7 miles (11 kilometers) above the martian surface. Think of looking out your window on your next long-distance plane ride-it roughly opens at the same height of a commercial passenger plane. But, now imagine rushing down from that height at 900 miles per hour (405 meters per second). That's Mach 2, the top speed of an F18 fighter jet! Luckily, the parachute slows the spacecraft down a lot more, about 9% of its original energy on atmospheric entry. Using the same shape and materials as past Mars landers and rovers, Curiosity's parachute is over two times larger by area than those used for the Mars Phoenix lander and the Mars Exploration Rovers Spirit and Opportunity. When the spacecraft is about 5 miles (8 kilometers) above the surface of Mars, zipping down now at a mere Mach .7 (about 310 miles per hour or 140 meters per second), the heat shield pops off and drops away. Bye bye, heat shield. Job "well done" and a "toast" to you! You took a lot of heat in getting the job done! With the heat shield whisked away, it's a little like taking off a lens cap. The Mars Descent Imager now has a clear view for recording the first ever video of a Mars landing. This movie can give us a "rover's eye" view of the rapidly approaching Martian surface as if we were landing with it. The camera's taking pictures, but whoa, what's measuring how far the spacecraft is from the ground? That would be the radar system, calculating speed and altitude with six radar beams. Without it, we could only estimate the spacecraft's height in the air within plus or minus 6,500 feet (2,000 meters). When you're trying to land softly, that's too much mystery! Engineers want radar lock by the time the rover is about 1.2 miles (3 kilometers) above the surface so that the spacecraft can figure out when to start powered descent. Too early and the spacecraft will run out of fuel. Too late and the spacecraft won't have enough time to stop before hitting the ground. While the radar only has to function for two minutes, it's so important that engineers tested it over 100 hours, dangling it from a helicopter over the Mojave and Death Valley. Time to take a deep breath, let go of our security devices, and commit to brief free fall. Some 80 seconds after heat shield separation, the backshell, with its parachute still attached, separates and flies off from the descent stage. For engineers, it's like the feeling of jumping out of a plane for the first time: it's a leap of faith, based on a lot of hard work and prior training, but still breathtaking. With the rover tucked underneath and acting as its computer "brains," the descent stage is now on its own, about 0.9 miles (1.6 kilometers) above the ground and traveling 180 miles per hour (about 80 meters per second). Almost home! Get out of the way, fast! All eight retrorockets on the descent stage fire, doing a divert maneuver to get away from the departing backshell and parachute so that they don't all crash together. These retrorockets will control the vehicle's descent until the rover separates from its final delivery system. Here comes the first use of a "soft landing" method called the Sky Crane maneuver. It allows the rover to land safely on its wheels without any kind of extra cushioning. Think of a large crane on a construction site that lowers a steel beam for a skyscraper to the ground. What happens first is rover separation. Once the engines slow descent to about 1.7 miles per hour (0.75 meters per second), the descent stage maintains that downward speed until the rover touches down. Four out of eight retrorockets shut off before three nylon ropes (the bridle) and an "umbilical cord" begins to spool out. About 25 feet (7.5 meters) long, they lower Curiosity from the descent stage. The rover is now at an altitude of about 66 feet (about 20 meters) above the surface, and about 12 seconds before touchdown. Curiosity's wheels and suspension system, which doubles as the landing gear, pop into place just before touchdown. It's a little like the way commercial planes release their wheels prior to landing. Engineers have tested the wheels and mobility system in all kinds of conditions, including steep slopes with a lot of large rocks, even though the extremes tested aren't expected at the landing site. The bridle is fully spooled and very taut now as the rover descends "softly," perhaps kicking up some dust as its wheels touch down for the first time in its new home. It might even bounce a little. How does it know it has landed? The rover and descent stage are roughly the same weight, so, when half the weight is gone (that is, the descent stage detects that the rover is supported by the ground), the descent stage assumes that the rover has landed. That calculation takes less than a second. Once the descent stage detects touchdown, pyros cut the bridle and "umbilical cord." With this final directive and release, the descent stage no longer has access to the rover's computer "brains." Having completed its mission and now "unconscious," the descent stage flies out of the way, coming to rest on Mars at least some 492 feet (150 meters) from the rover, but probably more than double that distance. First Martian Day (Sol 0)! Given the time it takes for a signal to reach Earth from Mars, the mission team will technically find out about landing about 13 minutes later. Landing is scheduled for August 5, 2012, Pacific Time around 10:31 p.m. Earth receive time. What information will they receive? There's enough time before Earth drops out of sight (Earth "sets" below the horizon) for basic progress information to be sent back directly to Earth until about heat shield separation. After that, the mission team is dependent on the Mars Odyssey and Mars Reconnaissance Orbiter to relay the technical details of entry, descent, and landing. Odyssey will "live stream" data to the Earth during entry, descent and landing, while MRO will record the data being sent by Curiosity for later playback. Upon a successful landing, Curiosity's computer would switch from entry, descent and landing mode to surface mode. The rover would begin her first Martian day (sol) on the surface of Mars! First Drive: After landing when engineers first conduct tests to ensure the rover is in a "safe state"